A long black tongue gracefully curls towards the offered cracker. In the blink of an eye the crisp goody disappears down an elongated neck. Almost as a thank you ears give a tiny twitch before she turns to look for the next treat. We’re engaged with the nearly two dozen reticulated giraffes in the African Rift Valley Exhibit of the Cheyenne Mountain Zoo. 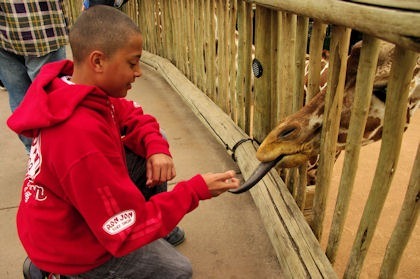 Elevated decking allows intrigued visitors to stand at nose-to-nose level with the gentle herd – the largest of any zoo. We learn the receptive tongues measure 18-21 inches with the inside portion pink in color and the visible last six inches a deep purplish-black. 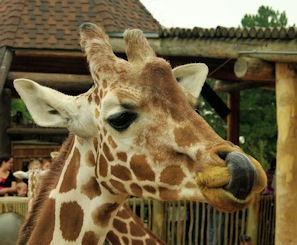 Who can resist purchasing the special nutrition-formulated giraffe crackers? Although additional animal encounters await, like many visitors, we find it difficult to move away from our favorite exhibit. Even after we’re out of crackers we enjoy watching others interact with the giraffes. While the adults nonchalantly move around the large outdoor enclosure two five-month-old male calves dart here, there and everywhere. Barely avoiding a belly flop, Mashaba skids to a halt with legs widely splayed. We’re able to identify the giraffes by name from exhibit information describing each unique reticulated (netlike) pa ttern. 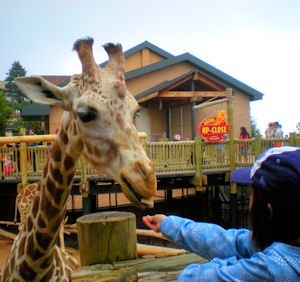 The Cheyenne Mountain Zoo giraffe herd can be found outside during zoo hours on dry days with local temperatures above 40 degrees Fahrenheit. Visitors enjoy watching the long-necked creatures pass through their specially designed drawbridge at 9:15am and afternoon – 4pm in winter, 5pm in summer. When we found ourselves spending the night in Garden City, Kansas I nosed through the local information to get a feel for the community. The first fact that jumped out at me was that Garden City, population around 28,500, had a zoo. I was intrigued. How large a zoo? What kinds of animals? 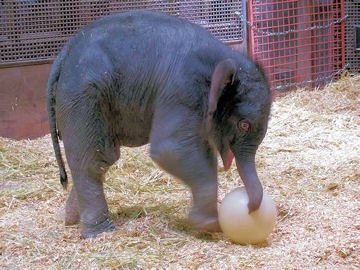 How did this city in southwestern Kansas come to have a zoo? Two weeks later we once again spent the night in Garden City on our return trip from Oklahoma. Before I left town I had to see the Lee Richardson Zoo for myself . After a early morning drive through I was even more impressed and intrigued. The story got more interesting with a bit of research. 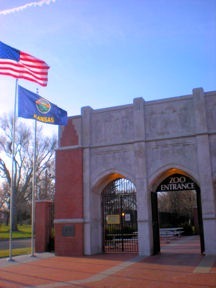 Of the seven Kansas zoos accredited by the Association of Zoos & Aquariums Lee Richardson is the oldest; founded in 1927 as a joint effort between the city and the local chapter of Izaak Walton League. The original intent was to house species from the local area. Committee members were charged with finding animals to donate. The first to arrive were two skunks brought in by Lee Richardson. Today the zoo is home to over 300 animals representing over 110 species from North and South America, Asia, Africa and Australia. 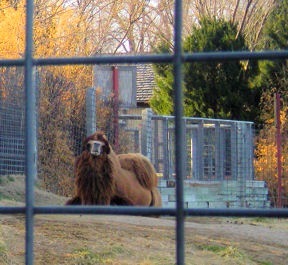 Located in Finnup Park south of downtown, the zoo covers more than 50 acres which one can circle on a drive through or walk the many intertwining paths. Walk through admission is always free as is drive through before 10am. After 10am the fee is $3 for one zoo trip. Because we wanted to get back to Denver before an impending snowstorm hit we didn’t have time to do the zoo justice. As we made our morning visit the only other people around were employees and construction crews working on new facilities. It would have been great to leisurely stroll the pathways. Instead, from the car we noted the majestic African Lion watching as we passed by. Jaguar, bison, red kangaroos, antelopes from Asia, Africa and North America, one and two hump camels (Dromedaries from North Africa, Bactrian from the Gobi Desert) – even on a short visit we could see the wide range of the animal world represented. Habitats looked well cared for, large trees provide summer shade and signage was attractive and informative. For instance, I learned that the Bactrian camels – the two hump variety – can withstand temperatures from –20 to 120 degrees Fahrenheit. The humps store not water as commonly assumed by are fat reserves. To learn even more visitors can use the cell phone audio tour feature. At each location the blue cell phone emblem appears just dial up the number on the sign. The service is free. Want to try it from home? Dial 620-805-3002 and enter any number between 1-42 when prompted. 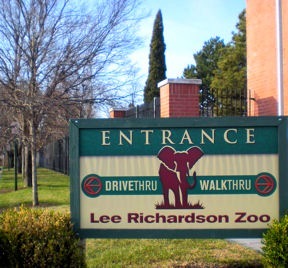 Nearly a quarter of a million people visit the Lee Richardson Zoo each year. Obviously I was the one in the dark; now, I know we have a definite reason to return. 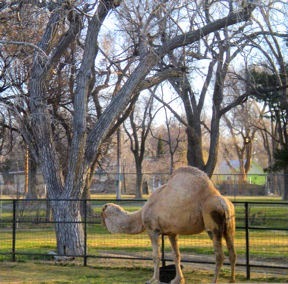 When You Go: Visit the Lee Richardson Zoo – labeled the Oasis of the Plains – 7 days a week. The Zoo is open from 8am-6:30pm from April 1-Labor Day and from 8am-4:30pm from the day after Labor day to March 31. We recommend the Holiday Inn Express for overnight lodging. Nothing extra fancy but everything worked plus the room and public areas were well maintained. Linens, bath amenities and complementary breakfast met or exceeded the company’s standard. Appreciated the warm cookies in the evening and the bowl of shiny crisp apples for road food. Looking for local dining instead of the nationwide chains we were directed to Samy’s Spirits/Steakhouse in the Clarion Hotel. Since this is BEEF country we decided to go with the Monday night special – prime rib dinner for two. This included the soup and salad bar (Bob says the vegetable beef soup was the best part of the meal), choice of potato, veggie (asparagus that evening), warm bread and 10 ounce cut of prime rub per person. Bob requested an end piece and they were able to accommodate. Plus, for dessert one generous slice of Black Forest Torte was included. We took ours to go; couldn’t manage dessert until the next day.